Crunch. Crunch. Those crisp fall leaves you're stepping on can mean only one thing ... sweater weather is here again. It's time to break out your fuzzy, fluffy and chunky knits for your favorite time of year. If you only add one piece to your cool-weather wardrobe this year, it has got to be this waffle-knit pullover from Jones New York. The scrunch-neck design pairs well with everything in your closet. 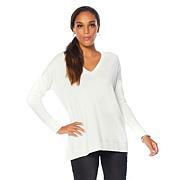 These sweaters are quality made, shaped good and I love the loose funnel neck with drawstring. The colors are beautiful as well. This brand is really good quality and worth the price. I got 2 but may still get the gray just because they're so nicely made.